This question requires more than just a simple yes or no answer. Regretting adoption is not generally the real question. 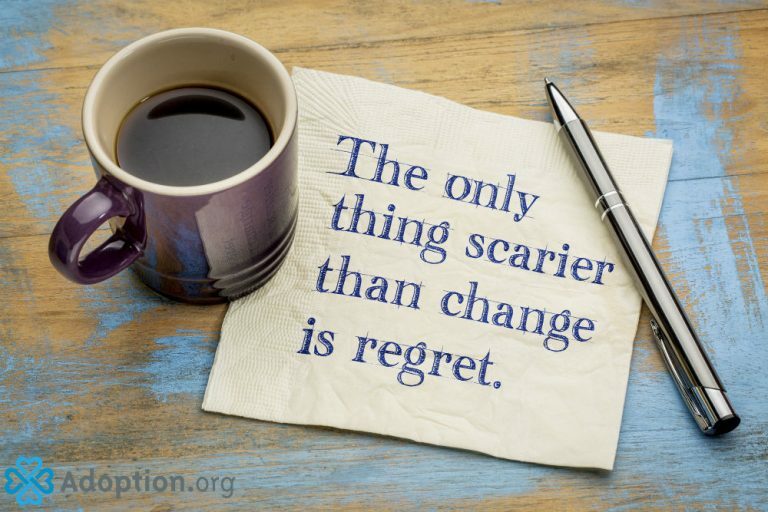 Most who ask about regret are actually asking, “Is it ok that I am not sure about all of this?” or, “Is it normal to be terrified of the unknowns that adoption brings?” The answer to both is, “Absolutely!” I would probably be surprised by someone who wasn’t at least a little scared or unsure. The adoption journey is incredibly harrowing. From finances to legalities to the fear of failed matches, the anxiety of the adoption process is palpable. In all of my years in the adoption world, I have never met someone who reported regretting adoption. I have, however, met many people who have said they began their journey with hesitance or reservation. When my husband and I were asked to adopt for a second time, there were reservations. While I could not imagine life without my son now and knew at the time that the answer would ultimately be yes, we were terrified to adopt again. Our first adoption experience was incredibly arduous—to put it lightly. While that is another story for another time, we were not ready for another uphill battle only 18 months after adopting our daughter. However, we knew the fight was worth it. That doesn’t mean we didn’t still have reservations. We weren’t sure how we would afford another adoption nor how we would handle adding a child to our family. We were sure everyone around us would think we had gone insane. We knew what our answer was, but the nagging reservations were still there. Fear is normal. Fear is healthy. Fear is a driving force. For us, we do not regret for one second either of our adoption journeys, because we have two amazing children who came the journeys. You can have doubts and may even decide that adoption is not the right choice for you or that the timing is off. However, if you take the leap to adopt, I can all but guarantee it will not end in regret. It was unfortunate that the first adoption process had to be such a battle, but I would fight that battle 10 times over for my daughter.